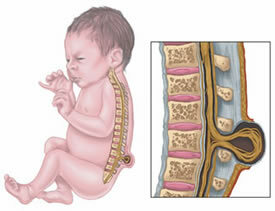 For some children, evaluation for spina bifida begins before they are born. A prenatal test measures the level of maternal serum alpha-fetoprotein (MSAFP, or AFP), which is unusually high in women carrying a fetus with spina bifida or other neural tube defect. This test usually is done as one of 3 tests known together as the “triple screen.” The triple screen includes AFP, ultrasound, and testing of amniotic fluid. Any pregnant woman who has a high level of AFP should undergo 2 additional tests that are very accurate in detecting severe spina bifida: ultrasound of the fetal spine and testing of the amniotic fluid for AFP. Amniotic fluid is the fluid that surrounds the fetus in the womb. A small amount of the fluid is removed through a large needle and tested in various ways that might indicate abnormalities in the fetus. Removal of amniotic fluid is a safe, routine procedure called amniocentesis. Thorough analysis of individual medical history (if not newborn), family medical history, and details of the pregnancy and birth. Physical examination focusing on neurological deficits, musculoskeletal deformities, and psychological evaluation; in an older child, assessment of developmental, social, and learning disorders. Evaluation of critical body systems such as heart, blood circulation, lungs, and kidneys to ensure child’s ability to undergo surgery. Imaging studies are done as needed to detect new or worsening complications. X-rays are used to detect vertebral abnormalities, scoliosis, hip deformities, pathologic fractures, and other bony abnormalities that are common and may or may not cause pain and other symptoms in spina bifida. Ultrasound may be used to assess an area of pain that suggests pathologic fracture. CT scan of the head is used to evaluate for hydrocephalus. MRI provides the best detailed information on spinal cord abnormalities and the extent of cord and nerve root involvement. Gait analysis is an assessment of the child’s walking skills. Walking involves many different body systems, including the brain, the sensory organs (such as the eyes), the spinal cord and nervous system, the bones and joints of the neck, back, hips, legs, and feet, and the muscles, tendons, and ligaments. Gait is a complex activity. It can be impaired by any defect in any of these systems. Gait analysis looks at all these systems and their interactions to identify patterns and problems in balance, movement, strength, and coordination. The findings of gait analysis can be used to help people with spina bifida improve their ability to walk.